Did you know that summer and fall tend to be peak periods for home renovation? In part, it's because of the fair weather, and it's also because that's when people are making changes to the home after kids leave for college...and before people start arriving for the winter holidays. Speaking of which, why, exactly, are we telling you this in the middle of December? Well, because if you're willing to remodel in the late winter and spring, you can actually get a deal on remodeling, because your contractor won't be as busy. That means the job is more likely to be done quickly, and you may be offered a discount for remodeling during the off season, precisely the team when your contractor's looking for work. So now is a really good time to start thinking about any changes you want to make to the house in 2014, to prepare for contacting a contractor early next year to talk about your options. If you're thinking about remodeling your Chicago kitchen, you may as well start focusing on some of the trends for 2014, but before we plunge in, some words of caution: trends come and go. They tend to move particularly quickly for bathrooms and kitchens, and they can get very, very spendy. If you commit to a perfectly on-trend space, it's quickly going to appear dated, and you may find yourself remodeling again in the near future. So remember: trends are great, but at the same time, try to think timeless and classic...and consider how current trends can be integrated into classic themes (and how your space can be made easily changeable to take advantage of trends as they shift without having to tear it apart every time). One of the top predicted trends for 2014 is, unsurprisingly, going green -- not exactly a new fad! Going green is one of the few trends we can endorse whole-heartedly, because it's not just keeping you on-point with the latest style. It's also going to save you money in the long term, and it helps out the planet, so it's pretty much a win for everyone. How do you know which green gadgets are right for you? Talk to your remodeling team about the options available, their costs, and their net savings. Be wary of new products that might not be fully tested, and remember that sometimes going green is about reducing usage in the first place, rather than buying a specialty item (do you really need a wine chiller?). Some things to think about: high efficiency dishwashers, which are better than handwashing by far; recycled countertops; certified sustainable wood flooring; and reclaimed tile for backsplashes. In kitchens, chef's stoves are big right now, and have been for a few years. The "gourmet kitchen" is taking over magazine spreads and it sure looks appealing when you walk into a home with a lavish kitchen. But be realistic about how much you use your kitchen and your expectations. Is a large stove designed for a restaurant right for you? Probably not. Most of the firms that make such stoves also produce models specifically intended for home use, which are a marginally better choice, but they still take more time to learn, require special cleaning, and can be more stove than you really need. Granite and quartz for counters are also targeted trends for 2014, and they deserve another note of caution: while they look great, are very durable, and can make your kitchen sparkle now...they may appear outdated in the future. Remember, this kitchen remodel should last for at least 12 years, and when the fad for shiny sparkly things passes, your counters might start to seem like a real weight on your back. If you want stone, consider more modest materials that might weather the test of time more easily -- or take a look at concrete countertops, which offer a lot of stain and finish options. Fun with backsplashes using bright, bold tile patterns is also projected to be in next year (who knows, maybe some of those backsplashes will be done in Radiant Orchid!). Backsplashes can be a great way to liven up a kitchen space, and more than that, they actually represent a fantastic opportunity for design opportunity. 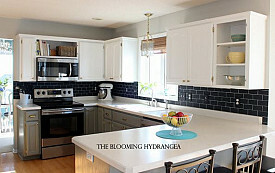 With the right design, you can make a backsplash easy to change without tearing the whole kitchen apart. So go ahead and let your imagination run wild on this one: when trends in color and backsplash materials shift, it's not going to be a huge ordeal to change yours up. Hardwood is big for flooring, and remember, you don't have to use solid hardwood thanks to a fleet of excellent engineered products at your fingertips. Consider easy-install products that can just as easily be changed, and branch out into bamboo and cork if you want to explore eco-friendly and intriguing flooring materials. Tile is always an option for kitchen floors although it's not projected to be very popular in 2014, and as for linoleum, forget about it. But what about pergo? This lively flooring material comes in a range of interesting colors and you might find that it's just what you needed. Stainless steel is still a leading trend for kitchen appliances, for all that it seems to smudge if you so much as look at it! If you're considering colored appliances (an emerging trend), remember that nothing screams "dated" more than colored appliances, sadly. That bold orange or bright red might look fantastic now, but could feel very different in five years. As an alternative, you might want to consider using removable colored decals to add depth, color, and texture to your appliances in a way that's not quite so permanent. Speaking of color, soft and neutral are dominating palettes for 2014, with white cabinets and soft accent colors. Interior paint is one of the most flexible and delightful aspects of interior design because it can be so easily changed, switched up, and explored, so don't be afraid about your paint job. That's one of the simplest things you can change about your new kitchen! Islands are great kitchen tools, and they're getting super popular. Here's what's fantastic about an island: it adds a prep and casual dining space, creates more storage, and helps a kitchen feel more dimensional. Here's what's not so fantastic: if your kitchen is too small, an island will make it feel cramped and crowded. So definitely consider one, but if it won't fit, don't force the issue. Creating space is another big trend, and no surprise. You don't necessarily have to do that by enlarging your kitchen, though. You can also open it up to other rooms or rearrange the layout to get the feeling of more space and atmosphere. With more and more people eating in their kitchens and turning them into entertaining spaces, that sense of openness, welcome, and space is even more critical. While you're working on designs for your new kitchen, remember that you need a timeless, functional space, and don't be afraid to assert yourself with your remodeling professionals to make sure their tastes don't override your own. You're the one who has to live with the result, not them!